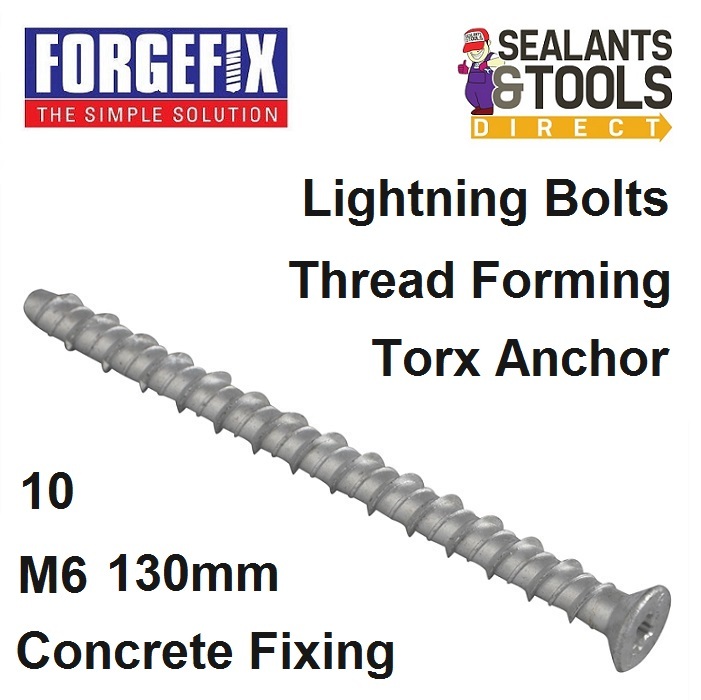 Forgefix M6 130mm Torx Head Grey Elementech 1000 Lightning Bolt screw is totally removable and cuts its own thread in masonry and concrete, simply pilot dill with the recomended drill bit and wind the bolt home. Medium to heavy-duty, thread forming anchor. Including brick, concrete, hollow brick or block work. Flange head acts as a fixed washer, distributing the load under the bolt head. The Lightning Bolt is particularly well suited for close to edge or fixing, as it does not expand and burst the surrounding base material. It is through fixing, eliminating the need for marking and re-positioning. Widely used for fixing batons, balustrades, handrails, racking and holding down machinery, Window & Door Fitting plus many more installation applications. Ensure the correct Torx drive insert bit is used for best installation results. Offers excellent resistance to corrosion. By design, TORX head screws resist cam-out much better than Phillips or Slotted screws. TORX head sizes are described using the capital letter 'T', followed by a number. A smaller number corresponds to a smaller point-to-point dimension of the screw head. Only the proper driver can drive a specific head size without risk of ruining the driver or screw.